With their expressive eyes, adorable wrinkles and wide smiles, it’s easy to see why Pugs are such a popular dog breed. Fitting a whole lot of personality into a small, stocky package – Pugs are fun-loving, affectionate, and cheekily wilful. Well known for their lack of impulse control when it comes to food, Pugs require a healthy, nutritionally balanced diet to keep their waistlines in check. 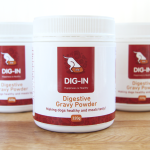 By supplementing your dog’s diet with Dig-In Digestive Gravy Powder, you’ll not only make their food taste great, you’ll also assist with the common symptoms of food allergies, such as an upset tummy, skin rashes, and ear irritations. Daily exercise also helps your Pug to stay healthy, but be sure not to overdo it – just a little each day is enough. While Pugs are generally low maintenance pets, it’s important to be aware of the signs and symptoms of the most common health problems which may impact on your dog’s wellbeing. Brachycephalic Airway Obstruction Syndrome (BAOS) occurs in dogs like Pugs with a reduced skull length, and results from excess soft tissue in their airways which may obstruct airflow. Symptoms can include your dog gasping for air and struggling to breathe during even moderate amounts of exercise. If you notice these symptoms, it’s important to consult your vet. Surgery can sometimes be required; however, the impact of this condition may be reduced by keeping your pug cool in hot weather, avoiding excessive exercise, providing lots of fresh water, and keeping your dog at a healthy weight. The bulging eyes of pugs are unfortunately prone to several serious eye issues which can cause chronic irritation and pain. With their large eyes, Pugs are at a high risk of accidentally damaging their eyes by running into obstacles. Symptoms of other eye issues include bumping into furniture and other objects, a discoloured eye discharge, weeping eyes, discoloured spots on the eye, and any unusual appearances in or around the eye. 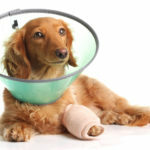 It’s important that you consult your vet as soon as you notice any of these symptoms, as quick action is often critical. Pugs are prone to allergies that cause itchy skin. In addition, their wrinkled folds of skin can trap dirt and moisture, providing an inviting place for bacterial skin infections (Pyoderma) to develop. Pyoderma is a bacterial infection with topical symptoms such as pimples, small red bumps, and blisters filled with blood. It usually occurs near the lips, feet and skin folds in Pugs. Your vet may treat a bacterial skin condition with medicated shampoos, or by adjusting your dog’s diet. 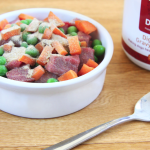 Consider supplementing your dog’s daily diet with Dig-In Digestive Gravy Powder to help keep your Pug in tip-top condition. Pugs have small legs that support a sturdy body, and this unique musculoskeletal structure predisposes them to bone and joint problems. Luxating Patella is a condition that causes the knee to become dislocated. Signs that your Pug is experiencing this condition are hopping, jumping, favouring one leg, and having difficulty getting up and down. Severe cases may require surgery. This condition can be brought on by excess weight, so be sure to feed your dog a healthy, well-balanced diet. Pugs may experience spinal problems, which in turn places pressure on their spinal cord, resulting in pain and possible loss of back leg function. While Pugs love to be included in family activities, it’s best to avoid games which involve your dog jumping from or onto high surfaces, to help reduce the risk of joint injury. Pugs can sometimes suffer from seizures, and if so, it’s important to consult with your vet as soon as possible to determine the cause. Seizures are the main symptom of Epilepsy, which is not uncommon in Pugs, and can be treated through medication and regular vet check-ups. 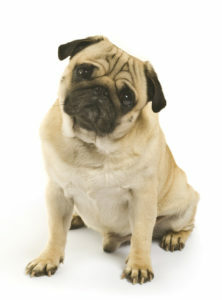 PDE (Pug Dog Encephalitis) is an inherited inflammation of the brain which tends to affect young to middle-aged Pugs. The main symptom of PDE is seizures, but dogs suffering from this condition may also seem lethargic, listless or display a lack of muscle coordination. 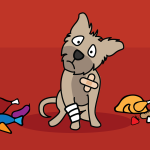 In consultation with your vet, medication can be used to control the seizures and reduce associated inflammation. Most Pugs live a long and happy life, even if these health issues need to be managed through appropriate vet care and a dedicated treatment plan. Always visit your vet at the first sign of symptoms or behavioural changes in your Pug, as quick action will help ensure your furry friend can get back to being their happy, adorable selves as soon as possible. Bondi Vet. Pug. Available from: https://bondivet.com/dogs/pug. 4 December 2016. Love My Pet. Pug Dog Breed. Available from: http://www.lovemypet.com.au/pug. 4 December 2016. Pug Village. 10 Tips to a Healthy Pug. 2011. 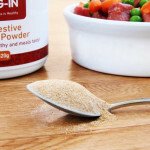 Available from: http://www.pugvillage.com/pug-health/10-tips-healthy-pug. 5 December 2016. Health Issues. 2016. Available from: http://pugworld.co.uk/healthissues.php. 3 December 2016. The Pug: An Example of Exaggerated Features. 2016. Available from: https://www.rspca.org.au/campaigns/pedigree-dogs/the-pug. 3 December 2016.